Whether you work as a wedding planner or you’re coordinating your wedding day it’s time to start fine-tuning the plans and focusing on the smaller details, like wedding chairs. Hiring wedding chairs involves a careful consideration of different elements. This information is also useful if you own a reception space and want to furnish it properly. One of the most common styles of chairs for a wedding is the banqueting chair. You’ve probably sat on these chairs at many weddings and events in the past, and you might have seen them at conferences too. They generally have a padded seat to provide comfort for guests. This is where couples often choose to use chair decoration and covers to make these seating arrangements blend in more with the formality and style of the wedding. Chiavari chairs also known as the Tiffany chair or Chiavarina are a popular choice for weddings. These chairs are similar to banquet chairs in some ways, but they are often considered to be a bit more elegant. You can select them in different styles. For example, you could purchase them in gold, silver, limewash or crystal resin. Therefore, whether you are opting for a more casual event or a truly elegant affair, you can have a chair that matches with the style and tone. If you love a traditional, old-world look, then these traditional wooden crossback chairs are the perfect fit for your event. Generally, these chairs are suited for indoor celebrations. You could blend these chairs in with different ambiences; however, they can really work well in a space that has other woods in the decor and space. Such chairs can take your guests back to a simpler time and make them feel cozy. If your ceremony or reception space has a fireplace, putting these chairs near it can really increase that appeal. While you probably won’t use wooden folding chairs for an indoor event, these types of chairs are quite popular for outdoor celebrations. Do keep in mind that the legs often cannot hold as much weight as some other styles, so you may want to mix these chairs with other ones so that all of your guests are comfortable. You can get these chairs in brown or in white; the choice is up to you. If you have been to outdoor wedding ceremonies, you will probably recognise the white wooden chairs. Many couples choose to have these chairs in honour of the nuptial ceremony. A rustic wedding is truly enhanced when you opt for benches over traditional chairs. Benches can help to bring a more casual vibe to your wedding, but they can also be used in a formal way. Just imagine stunning benches with bursts of white flowers tied around the legs. These benches are also freestanding, which makes them more accessible for your guests. Keep in mind that when benches are attached to the tables, it is often difficult for some guests to get in and out of their seats, especially when they are adorned in formal attire. Looking at all of the options for wedding chairs can seem overwhelming, especially when you don’t have any criteria to guide you. Instead of getting yourself into this situation, take the time to review these criteria and determine what it is that you want in the chairs. Then, you can see which styles match with your needs. The style of the space that you’re adorning has a significant amount to do with the chairs that you select. For example, if you own an outdoor venue or are planning an outdoor wedding, chairs that have a more rustic appeal are appropriate. On the other hand, you might be throwing an event in a ballroom. In this case, you’ll likely want more formal chairs to match with the luxury of the reception space. You should also take into account the colours of the space. While the chairs don’t necessarily need to match the walls, fluidity in colour should exist. If you are invested in fashion, you probably know that comfort is sometimes sacrificed for the sake of style. Planning a wedding is, in some ways, a fashion statement. However, you do need to remember that you’re asking your guests to sit on these chairs. If you fall in love with a certain chair style that isn’t particularly comfortable, consider using it for the ceremony or the cocktail. When the ceremony is short, guests might not mind a less comfortable seat. During the arrival reception, many guests choose to walk around and mingle. You will also need to decide if you want to have enough chairs for all of your guests. At first, you might laugh at the suggestion that you wouldn’t, but you should consider how people have different styles when it comes to their weddings. For example, you have probably been to a wedding reception where there actually wasn’t a seat for every guest. Some guests may have roamed the grounds, and others might have walked from group to group, chatting with their relatives and friends. For a formal sit-down dinner, you absolutely must have a chair for each guest, but if you’re opting for a more casual style, guests may choose to sit elsewhere. As you thinking about quantity, you also must consider the different venues. When the ceremony and reception are at the same site, the reception hall staff members may move the chairs for you. They may also move chairs from the ceremony to the reception room. You need to know this information though. It is inappropriate to ask your guests to carry their own chairs from space to space. If you are selecting chairs for your wedding, you may not care too much if they last beyond the day of the event. However if you are running a business, then investing in quality chairs should be a priority and it is certainly a smart move to spend a little bit of extra money to make sure that the chairs that you’re buying are going to last. When you’re having an outdoor wedding with a rustic vibe, you may want to opt for picnic tables and benches instead of traditional chairs. At a reception hall, you may need to save room by having more guests sit at one table. Do keep in mind that both of these decisions can cause accessibility issues with the tables. If you opt for picnic tables and benches, make sure that there is room at the head of the table for a wheelchair and that the benches aren’t attached to the tables so that guests can climb in and out with ease. At tables, you may need to have fewer guests at some tables to accommodate guests who need more space. 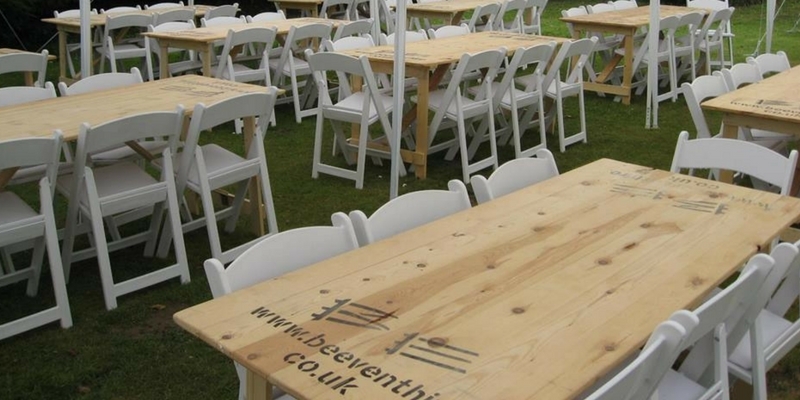 Check your table sizes and if the chairs you are thinking of are standard size or slightly larger. You don’t want to be using a 6 foot table that would ordinarily accommodate 12 standard seats, to find that you can only fit 11 or 10 chairs around the table. Always check your sizes. While you could go for the traditional all white look, you don’t have to. You could choose chairs that match with the theme or that show the favourite colour of you and your partner. 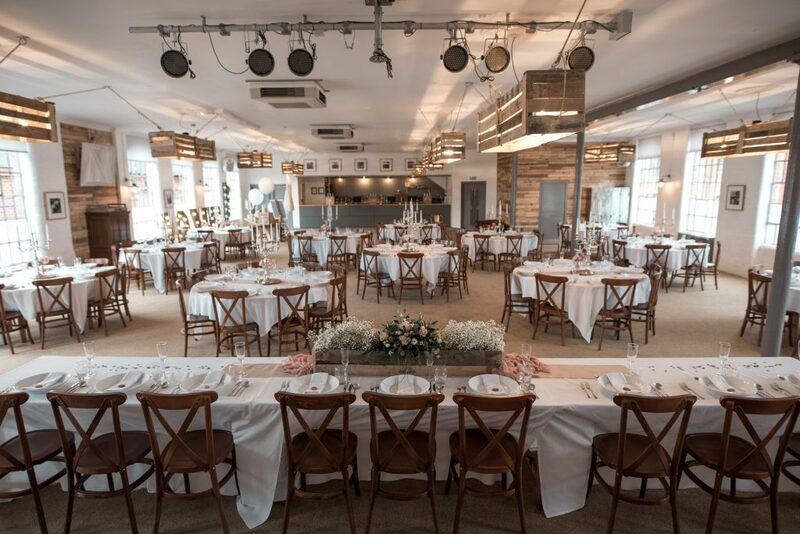 In the event that you own a reception hall, you may wish to hire chairs that are of a neutral colour but have chair covers in different colours available for couples who want to add their own finishing touches. Chair covers can help to emulate varying moods in the reception space too. As much as you may not want to think about the budget at all when it comes to your wedding, its necessary. Do keep in mind that many chairs are available at affordable prices. Owners of reception spaces should definitely ask if discounts are available on bulk buy orders. When you fall in love with a certain set of chairs, you may begin to worry about whether or not they will match with the tables. Depending upon the reception space, you may not have the ability to change out the tables. In these situations, you will have to take the type of tables into account when you are picking out the chairs. In other situations, you can hire your own tables. Fortunately, you can find a host of tables that match with the chairs. Whether you want a rustic picnic table or a more formal circular one, you can get those items too. As you start to work out the smaller details of your wedding planning, you will still have many decisions to make. 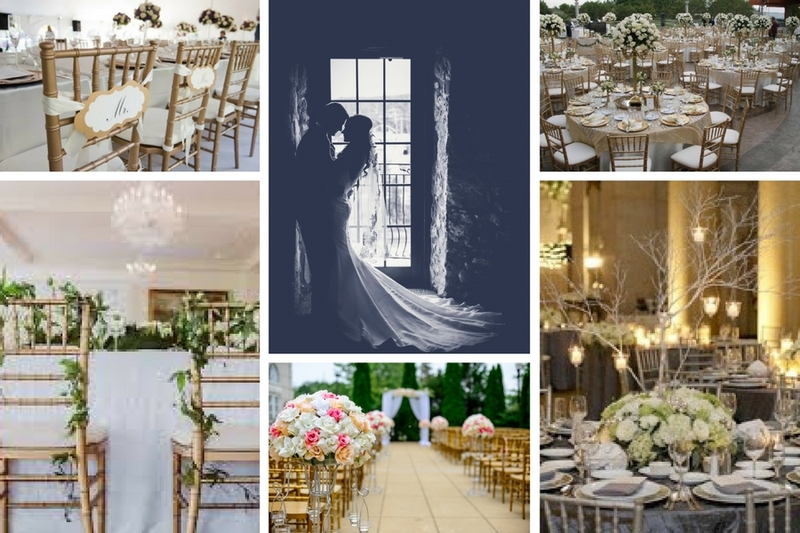 When it comes to the chairs, tables and corresponding pieces, you should check with the reception and ceremony spaces. You have so many options to choose from, take your time and find a chair that suits you.